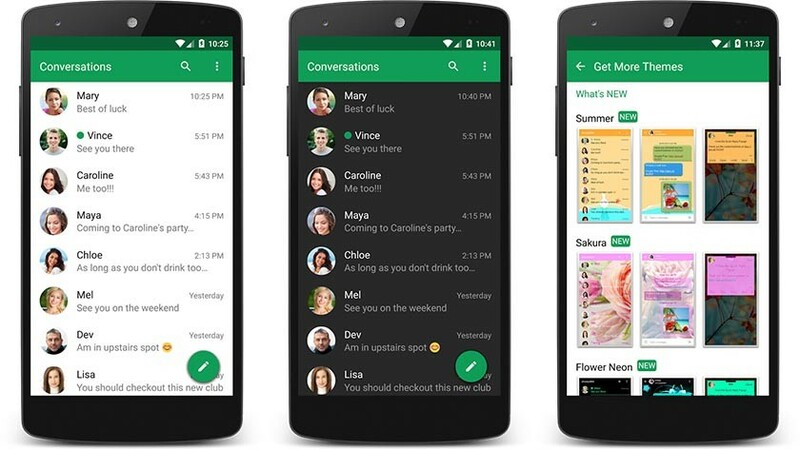 Messaging Apps for Android :- With the inevitable action of Time, Messaging took a huge turn on smart phones, and internet access became common.The era of instant messaging apps came, and nobody sends SMS anymore. Here we have with us a list of 5 of the best Messaging apps for Android 2017. I have personally tried and tested all of these apps. Inarguably the most famous messaging app of our times. It has the largest user base. Today almost everyone with a smartphone uses this app to stay connect with their friends. The user-friendly UI and simplicity are what makes it the top most choice, however so is the fact that it is popular and word of mouth gets them a lot of users. However, It does not have many of the features that more modern apps like Telegram have. Installation is pretty simple and straightforward. It requires a mobile number to sign up. The chats are encrypted with the end to end encryption. Recently they introduced both voice and video calls and both of these works awesomely well. There is even a web version but requires that the mobile is connected to the internet. You will need google play services APK to run this or any app from this list. Do checkout about Sony playstation 5 on our partner website. Developed and marketed by the social media giant, Facebook, Messenger also has a lot of users. It replaced the chat option in facebook app and users were used to install it. Unlike Whatsapp, Messenger stores it’s chat and media on facebook’s servers and is thus never lost, even if you uninstall the app. It has a desktop version and does not require the mobile to be connected to the internet, unlike WhatsApp. One important feature of Messenger is the chat head option that minimises the app to a small circle that stays on top of other opened apps, so that you can talk while working on other apps and just close and again resume as needed. Some features worth mentioning are Chat Nicknames, Chat colours, Inbuilt games, etc. Developed and marketed by the search engine giant, Google, Allo gained a lot of users in the short period since its release. This was primarily because of the fact that it was made by the great Google, and it is a known fact that Google never disappoints, and it sure did not. Besides that, this was the first messaging app to integrate an artificial intelligence tool. Yes, Allo took a giant leap via it’s feature called automated replies, where the app suggests responses to chats based on what the another person has messaged. It is a pretty useful feature, and I found the responses to be correct and contextual. Allo was also the first platform to have the great Google Assistant integrate. Google Assistant is Google’s virtual assistant, like Apple’s Siri. It also uses a smart AI algorithm to help you with our tasks. It can tell you jokes, facts, quotes, set reminders for you, make calls for you, search the web for topics for you, give you news, etc. One feature that I liked are the integrated games. Just say “Games” to the Google Assistant to open up a menu of the games you can play. The games range from Tic-Tac-Toe to the good old PAC-MAN. Telegram has some features that the other apps don’t have, It is built with privacy in it’s core. It doesn’t show you if a message has been delivered but not read. It doesn’t show the phone numbers of other members of a group and gives a lot of rights to admins. There can be up to 5000 members in a group, and huge size files could be sent. You can also check out the this post about Top Torrent sites to download Games, Music and Movies that you want. The UI is also very smooth but is not that much eye candy as WhatsApp or Allo. Moreover, there are no voice calls or video calls. Developed and marketed by an Indian company, Hike gained a good name over the years. The stickers they have is a great feature and is fun. All the usual stuff like voice calls, video calls, group chats are in it too. It has conference calls, something not many apps offer. Hike can also send a limited amount SMS for free if any user is offline. What to Look for in an Antivirus Product?